Microsoft is now rolling out new Windows 10 Creators Update Insider build 15031. The latest build brings few new features like new Compact Overly Windows and Dynamic Lack for Fast Ring Insiders. There are other fixes and improvements also. Check out the complete list below. Do more at once with the new Compact Overlay window: Windows 10 build 15031 introducing a new compact overlay mode for UWA app developers. When an app window enters compact overlay mode it’ll be shown above other windows so it won’t get blocked. The best part is that compact overlay windows work just like normal windows in all other ways so app developers can tailor the experience with what they already know. Updates to the Movies & TV app and Skype Preview app will take advantage of compact overlay windows in the near future! Dynamic Lock: Dynamic Lock automatically locks your Windows 10 PC when you’re not around based the proximity of a Bluetooth-paired phone. If your Bluetooth-paired phone is not found near your PC, Windows turns off the screen and locks the PC after 30 seconds. To enable Dynamic Lock, make sure your phone is paired to your PC via Bluetooth and go to Settings > Accounts > Sign-in options and toggle Dynamic lock to “on”. New Share icon: Windows 10 build 15031 introducing a new share icon. Apps that used the “share” font glyph in Segoe MDL2 assets should get the change automatically. Tencent apps and games to crash or work incorrectly. Windows 10 build 15031 updated OOBE so that if there’s no detected audio output device, for example with VMs, it now skips Cortana’s introduction. [GAMING] fixed the issue causing popular games may experience crashes or black screens when trying to load due to a platform issue. [GAMING] fixed the issue where Game Mode is enabled system wide by default, however, the ON/OFF toggle in Settings will incorrectly show it as being OFF until the user manually toggles the Setting to ON which will cause it to update and accurately display the status of Game Mode system wide. Windows 10 build 15031 fixed an issue where the night light quick action was unexpectedly disabled in the last Insider flight. Windows 10 build 15031 fixed an issue resulting in audio going quiet each time the Start menu is opened after a SpeechRuntime.exe crash. Windows 10 build 15031 fixed an issue where Win + Shift + S wouldn’t work to capture a region of the screen if the Snipping Tool was already running. We also fixed an issue where taking a snip with the Snipping Tool would fail on 4k monitors when 60-80% was selected. Windows 10 build 15031 fixed an issue resulting in “Fn”+”Pause/Break” key not working to pause the checking progress when running chkdsk. Windows 10 build 15031 fixed an issue where resizing windows with a pen would be unexpectedly slow. We also fixed an issue where resizing a window across monitors with different DPIs could be unpredictable. fixed an issue where the Windows Ink highlight preview wouldn’t be visible in Web Notes when Microsoft Edge was using dark theme. Windows 10 build 15031 improved gesture recognition for 3 finger swipes on precision touchpads. fixed an issue where a number of files with the name GLOB(0xXXXXXX) could be unexpectedly found in the system root directory after upgrading. fixed an issue where you couldn’t rename disk volumes via File Explorer in recent flights. fixed an issue where rapidly tapping a button to bring up the new Share experience, for example in Microsoft Edge, could result in the Share UI not coming up again until the device had been rebooted. Windows 10 build 15031 fixed an issue resulting the lists of thumbnails in Photos and Groove Music visibly shifting up when the app resumed. fixed an issue where the Themes Settings page would blink when a theme was deleted. Windows 10 build 15031 updated the help string on each page of Settings to be a bit more succinct. Windows 10 build 15031 fixed an issue resulting in not being able to type ę on the Polish keyboard into the Settings search box. Windows 10 build 15031 fixed an issue where Cortana Background Task Host might have ended up using an unexpectedly large amount of CPU in recent flights. We also shorted the two factor authentication notification from Cortana so that it won’t be truncated. Windows 10 build 15031 fixed an issue where the UI to input credentials wouldn’t have keyboard focus after initiating a remote connection to another PC. Windows 10 build 15031 improved reliability when handling malformed Gifs in XAML-based apps. Microsoft is expected to release Windows 10 Creators Update in April. The next major update Redstone 3 and Redstone 4 will come later this year and next year respectively. 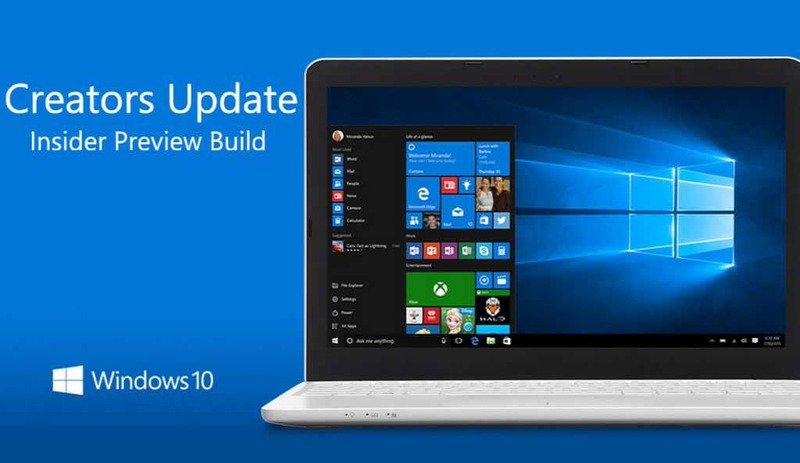 Windows 10 build 15025 ISO images are now available for download. You can download ISO from here.